Today, July 29, marks the release of Windows 10! We’ve been using Windows 10 Enterprise Technical Preview, and we’d like to share a few of the new Windows 10 features you will now be able to enjoy! The start menu is back! Many users of Windows 8.1 were frustrated by the tile display and missed the start menu from Windows 7. Windows 10 has a combination of the two which both show when you click on the Windows icon at the bottom left of your monitor. Like Windows 8.1, the tiles can be resized, moved or removed so you can customize your display. You can also pin apps to the taskbar at the bottom of the screen. If you remove the keyboard on your convertible tablet, you will have the option to enter tablet mode and use the touch screen. In addition, you can now use the Snap View feature to dock four windows to the four corners of the desktop. Windows 10 is designed to be used across all Windows devices. Windows Continuum transforms desktop applications for use on a mobile device, and lets Windows phones be used as PCs. You can even click through a PowerPoint presentation on your phone and display it on a TV or a large screen! You can now view all of your open apps in virtualized versions of your PC’s desktops using the Task View, the icon on the task bar that looks like two overlapping white rectangle panels. You can also use the Windows key + Tab to view the desktops. You can switch which app is open by holding down the Alt key and pressing tab to move to another app or by simply clicking on the virtual window of the desired app. The new Edge browser uses the Bing search engine by default. It has a Reading View that strips out the extraneous ads and navigation bars after it loads the page. Web Notes allows users to mark up a webpage with notes and then save the page as an image file in OneNote, Favorites, or Reading List. How do you get the new operating system? Users of Windows 7, Windows 8.1 and Windows 8.1 devices have one year from July 29, 2015 to register for a free upgrade. If you buy a new Windows device, you will also be able to upgrade to Windows 10 for free. If you have Windows Update turned on, your Windows system tray in the lower right corner should have a new icon displaying the Windows logo. When you mouse over it, you’ll see a popup message that says “Get Windows 10.” Click the icon for a popup that explains how the upgrade works and tells you how to schedule the download. If you have a Windows 10 compatible PC that does not get the notification, you can click on the Get Windows 10 app or the Windows Update control panel. Users who don’t install by July 29, 2016 will need to purchase the upgrade. If your device is managed as part of a business network, your IT administrator should manage the upgrade. Enterprise customers with active Software Assurance subscription in volume licensing will also be able to upgrade to Windows 10 enterprise offerings. Users of Windows Vista, Windows XP, Windows 8 (not 8.1) and Enterprise editions of Windows don’t qualify for the free upgrade, and will need to purchase the new operating system. Some older devices may not be compatible with Windows 10 and their users will need to purchase a new device to get it. Windows 10 Home retails for $119 and Windows 10 Pro for $199, and both are available online and in stores. If you want to upgrade from Windows 10 Home to Pro, the cost is $99. 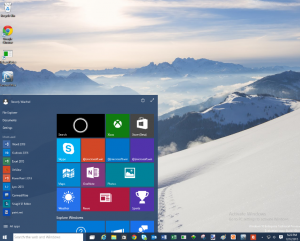 Windows 10 is designed to update automatically for the life of the device – in other words, no more “Patch Tuesday”. You’ll be able to set your device to download updates over the Internet or from updates downloaded on other PCs – such as those on your network. Contrary to the news published in many blog posts, Microsoft will not provide updates to Windows 10 forever. End of mainstream support will be October 13, 2020 and end of extended support will be October 14, 2025. If your business is ready to upgrade to Windows 10, Big Idea Technology is here to help! Call us to get started.